Poor Martin's Almanac: Creative Loafing's third annual fiction contest! 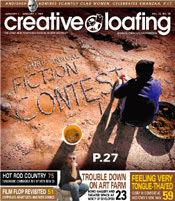 Creative Loafing's third annual fiction contest! I was selected from over three-hundred entrants as the first-place winner in Creative Loafing Atlanta's third annual fiction contest. The winning entry, “Hope Under My Fingernails,” is the story of a young boy who recently lost his father and suffers terrible abuse from classmates. To fill the holes in his life, he secretly builds a golem out of Georgia red clay. According to Creative Loafing's associate editor Suzanne Van Atten, "our first-place winner, 'Hope Under My Fingernails' by J.D. Jordan, not only rhapsodizes on the textural allure of dirt and its unsung sibling, mud, but it plays with the spiritual concepts of mankind's origins in clay." 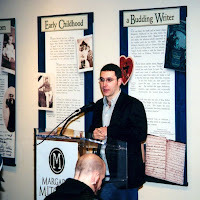 I presented a reading of “Hope Under My Fingernails” on January 8, 2004 at the Margaret Mitchell House in Atlanta. The event, "An Evening of Short Fiction Readings" was sponsored by Creative Loafing and also featured readings by Hollis Gillespie. Creative Loafing is an alternative newsweekly nationally known for coverage of news, culture, contemporary music and the arts. The Atlanta edition is the flagship of four weekly newspapers owned by Tampa-based Creative Loafing Inc. The Atlanta edition has a circulation of 3,180,000– the second-most broadly distributed newspaper in Georgia.